Is it better to give or to receive? Well, what about both? Despite there being different strokes for different folks, most of us can reach a consensus on what is worth having. 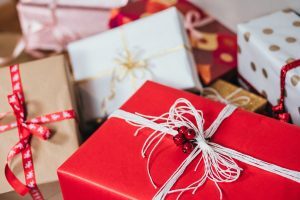 Here is a brief list of things you may want to bestow upon a loved one this holiday season in secret hopes that they plan to do the same for you! With the goal that the brave few who read through this article will not let friends and family die from unbearable disappointment come late December, here are ten things (under $100) that would be pretty dope to receive. Available for less than $30 this is the top-rated Bluetooth speaker that also happens to be quite economical! Why would you not want to be groovy on the go? Why not bring a smidgen of magic into the life of a muggle you love? Spice it up by providing a small basket of candy and popcorn as a supplement! Backpack, backpack! Where else are you going to keep all that stuff? Comes in colors a plenty! Isn’t it about time we all played, together? “It’s the future”, says Alexa. A social deduction party game for 5-10 players where players are given a card that assigns them to one of two parties: liberals or fascists. The liberals outnumber the fascists and can win if they learn to trust one another, whereas the fascists will say whatever to get elected and ultimately win by electing secret Hitler as chancellor. The holidays can be stressful, scary times for some people. Why not take away some of that anxiety with CBD gummies? A product of the USA, they are made with absolutely no animal products or gelatin that would have ever brought harm to any creature. Why would you only look like a snack when you can smell like one too? A gift that will be appreciated by somebody of any age or any gender! My mood improved by simply imagining what a mermaid splash would smell like. Literally the ultimate super smash bros iteration. It has every character that HAS EVER appeared in the franchise. It’s a safe bet to consider: Bayonetta, Meta Knight, and Pikachu as solid contenders for top tier characters. There are 70 characters to choose from, so it will take quite some time to get stale. They come in shark, bunny, fox, crocodile, sheep, and even more! Memory foam, fuzzy, what else can you even ask for? Bless the feet of somebody you love.